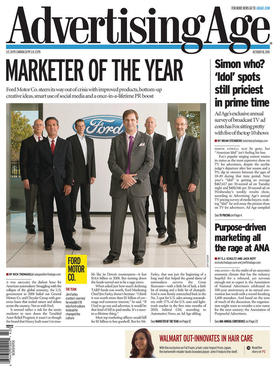 Ad Age honored Ford's marketers, including front man Jim Farley. -- The "Swap Your Ride" ad campaign, in which Honda and Toyota owners test drive Fords. -- The "Fiesta Movement" promotion, which lent out the car long before launch to young bloggers savvy about social media. -- The decision to launch the 2011 Explorer crossover on Facebook. -- Ford's TV spots for the F-150 pickup. The paper said the commercials, which feature actor Denis Leary's acerbic voice-over, "went against everything one is used to seeing in an ad for a pickup." But Ford's niftiest marketing move may have been turning down a bailout from the federal government's Troubled Asset Relief Program in 2009. Asked how much declining TARP funds was worth, Ford marketing chief Jim Farley ventured: "more than $1 billion of coverage and customer interest." Farley told Ad Age: "If I had to go out and advertise, it would be that kind of bill in paid media. It's a once-in-a-lifetime thing."